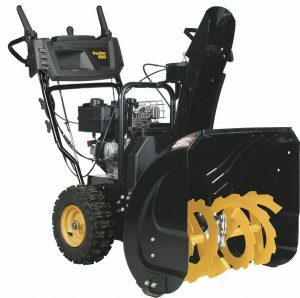 There are many factors that consumers should consider when they purchase a snowthrower. One of these is whether, does snowthrower size matter. And yes the size does matter for a number of different reasons.Many consumers will opt for a smaller machine in the 24 inch wide variety. There is absolutely nothing wrong with this size of machine. In fact they are much easier to store, taking up less room in an otherwise already cramped garage. The clear snow just fine and will do the job for most consumers dealing with relatively light snowfalls, 2 car width driveways and 2 car length driveways. Clearing snow will take 10 to 15 minutes and unless you are dealing wiht heavy wet snow or really well packed snow, these machines work just fine. If speed is a factor then yes a wider machine will make faster work of clearing snow. Wider machines, 28 inch for example come with larger tires, a more powerful engine and they weigh several hundred pounds more. Traction is better and they have the power to throw the snow further. Anyone with a long driveway will appreciate using a wider machine simply because it takes less time. Consumers who regular experience heavy snow falls or packed snow at the end of the driveway from the snow plow will also enjoy using a more powerful machine. From experience of using both machines the writer can tell you that even for a relatively small driveway, clearing snow is much easier with a larger more powerful snowthrower. The big stumbling block of course is the room it takes in the garage, which is at a premium. Still I would rather use this larger machine than fight through heavy snow with one that is lighter and less powerful. For more thoughts on snow blower features and what you should consider when purchasing a snow blower, click here.